HELICES E-PROPS - ELECTRAVIA, called here below "E-PROPS"
These General Terms and Conditions of Sale are intended to define the contractual relationship between E-PROPS and the buyers of its products, as well as the conditions applicable to any purchase made from E-PROPS, whether the customer is professional or private. The sales of the company are subject to these General Conditions, which prevail over all purchasing conditions, except formal and written waiver. These General Terms and Conditions of Sale are available on the E-PROPS website. It is up to each customer to read it before placing an order, by consulting them on the website or by asking them by phone, mail or email. Consequently, the fact of placing an order, whatever the method of placing the order, implies the customer's adherence to these Terms and Conditions, to the exclusion of all other documents issued by the company, which have not indicative value. E-PROPS reserves the right to modify its Terms of Sale at any time. In this case, the applicable conditions will be those in force on the date of the order by the customer. Unless proved otherwise, the data recorded by E-PROPS constitutes the proof of all transactions. The products offered by E-PROPS comply with the French legislation in force and the standards applicable in France. The responsibility of E-PROPS can not be engaged in case of non-compliance with the legislation of the country where the product is delivered (for example in case of prohibition of a product ...). It is the customer's responsibility to check with the local authorities the possibilities of importing or using the products ordered. The products offered are those listed in the catalogs published on the various E-PROPS websites. It is essential to refer to the detailed description of each product to know the specific characteristics. Quotations written by E-PROPS include the following: date of writing, name and address of the company, name of the prospect, detailed breakdown of each service, in quantity and unit price, total amount to pay excluding taxes and all taxes understood, and possibly the duration of validity of the offer. If no specific mention appears, for example in the context of quotes or proposals sent by e-mail, the quotes are valid for 7 full days from the date of issue. Privacy Notice: Information exchanged between persons requesting information, potential buyers and customers and E-PROPS are confidential, subject to confidentiality and intended for the exclusive use of the recipient (s). Any disclosure, reproduction or other dissemination or use of such communications is strictly prohibited. This is particularly the case for e-mail exchanges which are in no way intended to be widely distributed. E-PROPS reserves the right to prosecute any person who disseminates confidential information to third parties not concerned. The customer validates his order when he activates the "validate order" link and confirms the ordering process. Then he implicitly accepts the order process and these General Terms and Conditions of Sale. The data recorded by E-PROPS constitutes proof of the nature, content, date and method of payment of the order. Those data are archived by E-PROPS; the customer can access this archiving by contacting the customer service by email. Orders are only final when their payment has been fully registered by the E-PROPS Accounting Department. Then the commercial service of E-PROPS sends an Acknowledgment of receipt to the customer, which specifies the effective date of conclusion of the purchase contract. This Acknowledgment is sent most often by email; it can also be sent by post. The confirmation of the order entails acceptance of these General Terms and Conditions of Sale, the acknowledgment of having perfect knowledge of them and the waiver of its own conditions of purchase or other conditions. Prices shown are in Euros (€), based on prevailing economic conditions. Delivery charges may be included in the selling price, or charged at the end of the order in addition to the products ordered. If these conditions were to be modified for any reason whatsoever (duties, taxes, exchange rate, ...), the invoiced prices could vary according to changes in these conditions. The modification of the amount of the price to be paid will then be indicated to the customer, and will have to obtain his prior agreement. The price promotions posted on the website, communicated in the press, proposed by email or published by different partners, are valid over the period indicated and according to the conditions defined. Any deduction made on the invoices for any reason is deductible from the turnover and leads to a reduction proportional to the amount of the taxes (in France : VAT). An invoice is drawn up for each delivery, even partial. The invoice mentions the date on which the payment must occur. 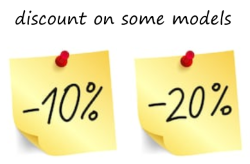 It specifies the discount conditions applicable in the event of payment at a date prior to that resulting from the application of the General Conditions of Sale, the penalty rate payable on the day following the settlement date entered on the invoice and the date of payment, amount of the lump sum indemnity for recovery costs due to the creditor in the event of late payment (€ 40, see Article D. 441-5). The settlement is deemed to be made on the date the funds are made available by the client to E-PROPS. Unless prior agreement under certain conditions, the price is payable in cash and in full on the day of placing the order by the customer. E-PROPS will not be required to proceed with the delivery of products ordered by the customer if it does not pay the price in full under the conditions indicated above. Payments made by the customer will only be considered final once the amounts due by E-PROPS have been collected. In addition, E-PROPS reserves the right, in case of non-compliance with the terms of payment above, to suspend or cancel the delivery of current orders made by the customer. Deliveries delivered by a carrier are made to the address indicated by the customer when ordering on the website, by email or mail. Except in special cases or unavailability of one or more products, the products ordered will be delivered at one time. In case of special request of the customer concerning the conditions of packing or transport of the ordered products, duly accepted in writing by E-PROPS, the related costs will be the object of an additional specific invoicing, on estimate beforehand accepted in writing by the client. In the event of damage or damage to the parcels occurring during the delivery, it is the customer's responsibility to formulate precise and detailed reserves on the carrier's delivery receipt in the presence of the deliveryman, and to confirm these same reserves by registered letter, within three working days of receiving the goods from the carrier and E-PROPS. In case of loss, the customer must notify E-PROPS in writing of the non-receipt of his order. An investigation is conducted with the carrier; this can take several days. During this period, no refund or return can be made. After confirmation of the loss of the package from the carrier, the customer will benefit from the refund of his purchase or the re-shipment of his order. In the absence of these reserves, E-PROPS will in no way be held liable, and therefore no claim for compensation may be granted. Delivery times are indicated as exactly as possible, especially for products priced above 500 Euros (article R 114-1 of the French Consumer Code). In case of exceeding the delivery date of the property exceeding 7 days, not due to force majeure, the customer has the opportunity to terminate the contract by registered letter with acknowledgment of receipt. The contract is considered broken upon receipt by E-PROPS of the letter by which the customer informs him of his decision. The customer exercises this right for 60 days from the date indicated for delivery or performance of the service. The sums paid to the order will be returned. A case of force majeure is an external event (that is to say beyond the control of the seller), unforeseeable and irresistible, which makes the fulfillment of the obligation impossible : see below Article 17. The characteristics of the products offered for sale are presented on the different websites. E-PROPS makes every effort to ensure that the photographs that illustrate the presentation of its products reproduce them as faithfully as possible, and above all, do not contain ambiguities and misleading statements that may mislead the client about the characteristics. and components of its products. In the event that a photograph and / or text contains an error or an inaccuracy, E-PROPS undertakes to rectify it as soon as possible. All the texts and images presented on the site are reserved, for the whole world, under the rights of author and intellectual property; their reproduction, even partial, is strictly forbidden without the formal agreement of E-PROPS. Similarly, any establishment of hypertext links to the site without the express authorization of the legal representative of the company is strictly prohibited. Purchases of all E-PROPS products are payable cash with order. An order confirmation is sent immediately by the E-PROPS commercial department. The possible fees due to the payment, whatever their nature and / or their origin, are integrally the responsibility of the customer. The invoice will then be either attached to the package containing the goods, or sent by email or post. E-PROPS retains ownership of the goods sold until effective payment of the full price in principal and accessories. In the case of incomplete payment, the client is therefore forbidden to dispose of the products in order to resell or transform them. The customer is obliged to immediately inform E-PROPS of any difficulties likely to cause his failure as well as any seizures made by third parties on products. In the absence of payment, even partial, E-PROPS will be entitled to demand the immediate return of the delivered material. All the costs generated by this refund will be borne by the client. In accordance with Article L.121-21 of the French Consumer Code, the customer has a period of 14 days working from the date of delivery of his order to return any item does not not suitable and request the exchange or refund. The return shipping costs are the responsibility of the customer, as well as the costs related to the refund (eg transfer fees). In the case of an order for several goods delivered separately, the withdrawal period runs upon receipt of the last goods. The client must physically take possession of the property in order to exercise his right of withdrawal. The return can only be accepted for products in perfect condition, properly packaged, complete (accessories, covers, screws, manual, technical notice ...), with a copy of the invoice. Items returned incomplete, repaired, modified, damaged or excessively soiled by the customer are not returned or exchanged. Please note: special manufacturing products, customised, are not returned or exchanged, except special case specified when ordering. The shipping costs, the mandatory insurance of the parcel and the potential customs duties must be paid by the customer. The manufacturing process of E-PROPS carbon propellers (RTM injection) depends on a large number of factors. - some variations in hue or appearance. These slight defects in appearance do not weaken the propeller, do not degrade its characteristics and do not affect its performance. They can not be considered by the customer as major defects and can not lead to the refusal of the acceptance of the order after the customer. - The returned propeller shall be in good condition, clean, with all its accessories (screws, flange, drive lugs, digital protractor, covers, documentation... initially delivered); damaged or broken propeller cannot be accepted with this clause. The products manufactured and sold by E-PROPS benefit from the legal guarantee of conformity (Articles L211-1 to L212-1 of the French Consumer Code) and the legal guarantee against latent defects (Articles 1641 to 1649 of the French Civil Code). E-PROPS warrants to the original customer that its products are free from defects in workmanship or materials, for a period that meets local regulatory standards, from the date of purchase. - the guarantee is valid only when the products are used according to its original purpose. In particular, the use of an E-PROPS propeller on any other engine (engine + gearbox) than that for which it was designed and marketed is prohibited, and cancels any E-PROPS warranty. - E-PROPS will perform a final warranty assessment, which may require inspection and / or product photos, clearly showing the defect(s). - If a product is found to be defective by E-PROPS, the warranty covers only the repair or replacement of the defective product. and generally, regardless of the cause except for a defect in the product due to workmanship or materials. The original invoice must accompany all warranty claims. The name of the dealer and the date of purchase must be clear and legible. There are no warranties that extend beyond the warranty specified herein. - have had registreted his propeller with E-PROPS, through the WARRANTY REGISTRATION PAGE (or directly by email helices@e-props.fr). - have informed E-PROPS, in writing, of the possible existence of manufacturing defects and / or an incident linked to the possible existence of a defect in a maximum delay of 8 days as from their discovery. 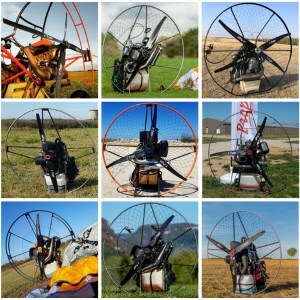 Each E-PROPS propeller, whether for ultralights, airplanes, paramotors or drones, has been designed, calculated, tested and manufactured for a specif set of engine - gearbox. At the time of the sale, all these indications are specified on the invoice and / or the delivery note. If the propeller is then purchased secondhand and the information has not followed, the new owner can join the E-PROPS team to ask on which engine his propeller can be mounted. The customer has just to give the serial number of one of the blades to the E-PROPS commercial department. Use of an E-PROPS propeller on any other engine than that for which it was designed and sold is prohibited, and voids any E-PROPS warranty. In particular, a propeller designed for an engine with gearbox must never be mounted on a direct drive motor : this would be extremely dangerous. E-PROPS products must be assembled and used in accordance with the "Installation, Operation and Maintenance Manual" or the specific notice. These documents are given to the customer with the propeller. Improper assembly, improper use and lack of maintenance of the products made and/or selected by E-PROPS can not in any case engage the responsibility and the guarantee of E-PROPS. Particular attention must be paid to the tightening of the screws to hold the propellers on the engines: this must be done with the utmost care, following the instructions in the Manuals and/or Notices delivered with each propeller. In case those Manuals or Notices are missing, please ask the E-PROPS team. All the updated Manuals and Notices can be found on the E-PROPS website. See DOCUMENTATIONS / MANUALS. Carefully read the Installation and Maintenance Manual and/or the Notice and follow the instructions before starting the engine with the propeller. In case of deliberate non-compliance with the instructions in the manuals, the guarantee can not be applied and the E-PROPS company can not be held responsible for any problems that may arise. E-PROPS reserves the right to sue a customer who deliberately chose not to assemble, adjust and maintain his E-PROPS propeller without respecting the instructions of the documents provided by E-PROPS. The user of the propeller must make sure that his propeller can not touch any of the components of the aircraft, in any configuration, on the ground or in flight. A shock between the rotating propeller and one of the components of the aircraft could be very dangerous. For any questions, the E-PROPS team is always available. At this time, the E-PROPS propellers are not certified to EASA or FAA aeronautical standards. E-PROPS propellers comply with ASTM F2506-13 standards, for LSA aircraft. They are used on experimental aircraft, ultralights, motogliders, paramotors, drones, and any vehicle on which an engine stop or loss of a propeller in flight does not involve safety. The user assumes the risks of using such propellers, and recognizes that his set of engine / propeller is subject to a sudden stop. In accordance with those aeronautical standards, the use of E-PROPS products on an aircraft is the sole responsibility of the owner of the aircraft. NEVER cut an E-PROPS extended hub (propellers for aircraft / ultralights). The extended hubs are designed and manufactured for a defined length. Cut them is similar to destroy the mechanical strength of the hub. This would be very dangereous. It is absolutely FORBIDDEN to fly with an E-PROPS extended hub which would have been cutted. If the hub has not the requested length, please contact the E-PROPS team for change. The change will be invoiced. If an incident requires repair on an E-PROPS product, it must be performed by E-PROPS or an authorized repairer after exchanges with the E-PROPS team. The manufacturing process of E-PROPS propellers (RTM injection on carbon braid) is very specific and requires specific materials, procedure and installation. Repairs other than small impacts in the resin can only be performed by E-PROPS or an authorized repairer who has received training from the company. A repair made by a person without the written permission of E-PROPS could be very dangerous. If an E-PROPS propeller has been previously unauthorized by E-PROPS, then no repairs or modifications can be made by E-PROPS. The damaged propellers sent to E-PROPS for expertise and which prove irreparable according to the analysis of the design office are not sent back to the customer. They are stored at E-PROPS for a year and then destroyed. The E-PROPS team refuses to take the risk that a damaged aeronautical product that is irreparable - and therefore dangerous - comes back on the market. Any intervention on the E-PROPS propellers without the prior approval of the team releases the company from all liability and in effect voids any warranty. When a parcel is shipped to E-PROPS by a customer for a repair or a component change : the shipping costs, the mandatory insurance of the parcel and the potential customs duties must be paid by the customer. Except in specific cases and with initial agreement with the customer, a sticker "E-PROPS" is placed on each blade of an E-PROPS propeller during manufacturing. Some hubs also come with stickers reminding of technical instructions. Note that these stickers are in place during balancing and final control of the propeller. It is not recommended to remove them. E-PROPS undertakes to provide, at the latest at the same time as the delivery of the product, the technical information necessary for the installation of the equipment transferred. These Notices and Manuals are available on the E-PROPS websites. See DOCUMENTATIONS / MANUALS. In case of unavailability of certain products, E-PROPS reserves the right to provide other products that fulfill the same performance criteria. The customer will, under his own responsibility, determine his needs and choose his equipment. He must ensure the payment of his orders and associated costs within the allotted time. He will have to make sure that the E-PROPS products are imperatively assembled and used according to the Manuals and Notices, and that the propeller is well mounted on the engine defined during the order. He will also have to make sure that the propeller and its accessories will not be able to touch any of the components of the aircraft. Improper assembly, incorrect tightening, improper use and lack of maintenance of E-PROPS products will in no way engage the responsibility and guarantee of E-PROPS. When a propeller is bought by an E-PROPS dealer for resale, the dealer is committed to delivering the whole propeller with all accessories to the final customer. For example : screws, flange, drive lugs, digital protractor, covers, documentation, manuals, goodies... If the dealer does not deliver the complete set, this would cancel any E-PROPS warranty. All information of the E-PROPS websites are and remain the exclusive intellectual property of E-PROPS. E-PROPS and UAV-PROPS trademarks are registered trademarks of INPI by E-PROPS. Nobody is allowed to reproduce, exploit, repost, or use for any purpose whatsoever, even partially, elements of the sites (software, visual or sound). Any single link or hypertext link is strictly prohibited without the express written consent of E-PROPS. Any total or partial reproduction of this content is strictly prohibited and may constitute an offense of counterfeiting. In addition, the company remains the owner of all intellectual property rights on studies, drawings, models, prototypes, etc., made (including at the request of his client) for the provision of services to his client. The customer is therefore prohibited from any reproduction or exploitation of said studies, drawings, models and prototypes, etc., without the express written prior authorization of the company, which may condition a possible agreement to a financial counterpart. E-PROPS, noting the event, will promptly inform the client of the impossibility of performing the service. The suspension of the obligations can not in any case be cause of responsibility for non-performance of the obligations, nor to induce the payment of damages and interests or penalties of delay. Upon the disappearance of the cause of suspension of obligations, E-PROPS will inform its client of the resumption of its obligation. By express agreement between the parties, this contract is governed by and subject to French Law . Those General Terms and Conditions of Sale is written in French. In the event that it is translated into one or more languages, only the French text will prevail in case of dispute. The parties will make every effort to seek an amicable agreement before any contentious action. All disputes to which this contract could give rise, concerning its validity, its interpretation, its execution, its termination, their consequences and their consequences will be submitted to the competent courts under common law conditions. In case of dispute with professionals and / or traders, the Courts of DIGNE-LES-BAINS (Alpes de Haute Provence) will be competent. The information collected through registration on this website is stored in a file computerized by E-PROPS for the management of its customers. They are kept for one year and are intended only for the commercial service established within the European Union. No information about E-PROPS customers is transmitted to any organization, structure, company or private.